In terms of quickness, the Tesla Model 3 wins the day. We were the first publication to get an extended drive of the Model 3 (which you can read here), but we have not yet recorded our own acceleration numbers. Tesla estimates the Model 3 will reach 60 mph in 5.1 seconds when paired with a long-range battery, or 5.6 seconds with the standard one. Tesla is also keeping quiet on horsepower, but we'd guess the sedan produces around 235 ponies. Meanwhile, Chevrolet estimates a 0-60-mph time of under 7 seconds for the Bolt. When testing our long-term Bolt, we were able to achieve the mark in 6.3 seconds. The model packs 200 hp and 266 lb-ft of torque. Although the numbers suggest it's not as zippy as the Tesla, we don't find the Chevy hatch underpowered at all. The Model 3 provides a standard 220 miles of range, but when paired with the more expensive long-range battery, it's said to achieve up to 310 miles. 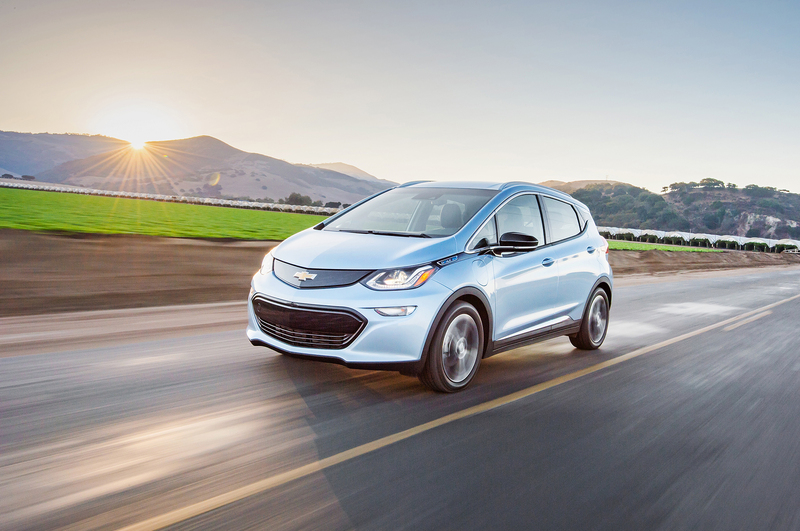 The Bolt splits the difference, offering an estimated 238 miles on a single charge. Speaking of charging, the Model 3 does it the quickest. It adds 30 miles of range per hour when plugging in with a 240V outlet, or 130 miles per 30 minutes with a Supercharger. The long-range battery version tops these numbers, being able to charge 37 miles per hour of charge with a 240V outlet or an impressive 170 miles in 30 minutes while Supercharging. It takes the Bolt 9 hours to fully charge up from a 240V, or 90 miles in 30 minutes with a SAE Combo DC fast charge. The Bolt EV comes paired with front-wheel drive and a permanent magnetic drive motor. 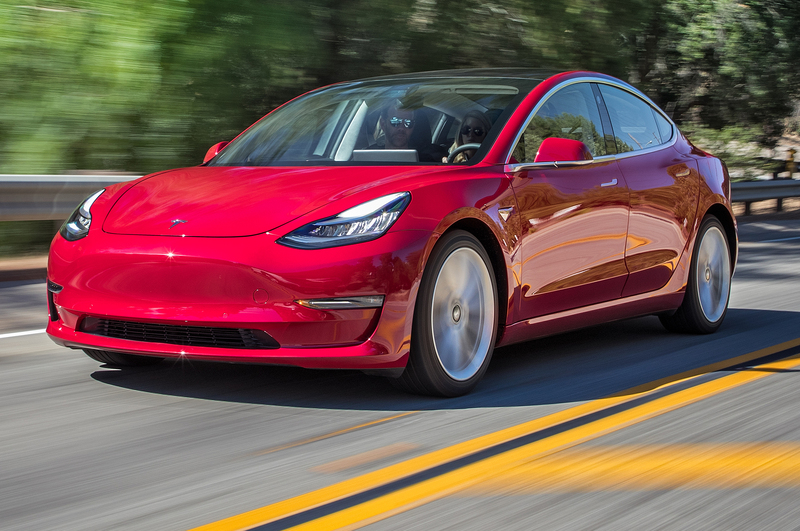 Initially, Tesla is offering the Model 3 in rear-wheel-drive form only, though an all-wheel-drive dual-motor version is coming down the line. Neither car is particularly lightweight, but the Model 3 and Bolt actually are pretty similar in this category. Curb weight for the Model 3 is 3,549 pounds for the standard version, or 3,814 on the long-range model. The Bolt weighs 3,580 pounds. The Model 3 is 184.8 inches in length, 72.8 inches in width, and 56.8 inches in height. As expected, the Bolt is shorter and narrower, measuring 164 inches in length and 69.5 inches in width. But it's taller than the Model 3 at 62.8 inches in height. The Tesla's wheelbase measures 113.2 inches, while the Bolt's is only 102.4 inches. Inside, the Model 3 boasts 42.7 inches of front-row legroom and 35.2 inches of second-row legroom. The Bolt keeps pace with 41.6 inches up front and 36.5 in the back. Standard headroom measurements are very similar on both models (39.6 front/37.7 rear on the Model 3, 39.7 front/37.9 rear on the Bolt). But in terms of cargo volume, the Model 3 offers 15 cubic feet while the Bolt boasts 16.9 cubic feet. Of course, perceived space is just as important as the numbers, so we won't really know how big each model feels until we step inside both cars and compare them side by side. Prices for the Tesla Model 3 start at $36,200 before incentives. That price goes up quickly when you add options, including the long-range battery ($9,000), 19-inch wheels ($1,500), special paint jobs ($1,000), and a Premium Upgrades package with heated seating, open pore wood, and other updates ($5,000). At the top end, the Model get up to around $59,500 before incentives. Oddly enough, the Bolt commands a higher starting price of $37,495. A few packages, including a comfort and convenience package and driver confidence package, are available to bring up prices slightly. Buyers can also opt for the Premier trim level, which starts at $41,780.